Leaves for Trees: Who is "my" Marcellus? My search for the White family of Salem, Roanoke County, Virginia has come to a grinding halt. This is a family line where I have found next to nothing in print regarding anyone in the family. I have only several censuses to guide me in my search. And I am not even sure that some of those are for the right "Whites." It is just one of those common surnames. There is a line of Whites that are well known in Roanoke County and the patriarch was Samuel White. He either built, or owned, a mansion and several houses called Fort Lewis. He was clearly a very wealthy man. In his will he gave the mansion house to his youngest son, Alexander. His second son, Edmund Penn White, was named executor and was given a tract of land known as the "Ned Taylor Tract" in Bedford County, Virginia, just north of New London. Edmund P. White married Sarah (Sallie) McClanahan October 14, 1820 in Botetourt County, Virginia. They are listed on the 1850 census in Roanoke County with five children: Gay, Marcellus, Ann, Lee and Mary. Page 2 of the 1850 Census listing for Edmund P. White, showing his son, Marcellus. Fast forward to Ray County, Missouri. 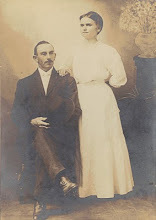 I have traced my White line from my grandmother to Hugh C. White, born March 16, 1876. According to his death certificate his parents were Marcellus F. White and Mary J. (Tosh) White, both born in Virginia. I am able to trace Marcellus and Mary back to 1870 in Ray County, Missouri. Other than his headstone and several censuses, I do not have many conclusive sources for Marcellus. A biography in a Ray County, Missouri history states that he fought for the Confederacy during the Civil War. There is only one Marcellus F. White that fought for the confederates in Virginia. He was a Quartermaster sergeant and was captured by the Union army following Gettysburg and spent time in the Union prison at Fort Delaware. He enlisted in 1861 at Salem, Roanoke County, Virginia. I have found several trees that link the Marcellus I know in Missouri to Edmund Penn White. The 1850 census I mention above does list a Marcellus, age 18, which would be the appropriate age for "my" Marcellus...as I have come to call him. But I have no conclusive link between the two. There is no death record on file for Marcellus. I cannot find an obituary for him in any of the Ray County, Missouri newspapers. There are also no probate records for him. I also have no information about Edmund Penn White's death. Roanoke County, Virginia has no record of any probate documents for him. I do know that Mary J. Tosh, "my" Marcellus' wife, was born in Roanoke County, Virginia through various documents. But I was unable to locate a marriage for Marcellus and Mary in Roanoke County. Their first child, Thomas, was born in Virginia in 1860, but there is no marriage record for his parents around that time. I have contacted so many sources in Virginia I could not even begin to list them here. I even had a chance to visit the great Virginia Room at the Roanoke City Library, but I came up with very little. Now I must wait for all of my emails to bear fruit. Oh, where can "my" Marcellus be? Have you jumped ahead & tried to get the will & testament of Edmund Penn White? You said there were none? Or an obituary for him? I would think with that kind of property that there is a trace somewhere... maybe if you were to trace the property only it would lead to your Marcellus? Just an idea... or trace his wife? Did they move from Ronake County, VA? Have you traced the Edmund Penn White line down to as current as possible? Maybe a link in other ancestors will appear if they are indeed related. I recently made a connection because of one seemingly odd man who had a different last name was living in the home of the brother I was searching! Completely random! Just some thoughts that came my way when reading your post. I love your blog... and I am not even related! LOL! Thank you for all of your kind comments. Yes, I live in Arkansas. I am not from this state, but we really enjoy it here...some much to do outdoors! Anyway, Edmund Penn White is my nemesis. I have searched for his obit, probate records, grave...anything. He is an enigma. I recently noticed in Edmund's father's will that Edmund was given property in Bedford County, Virginia. So now I have asked different organizations in that county to check out records for his disposition of said property. We'll see. Thanks for the tips!